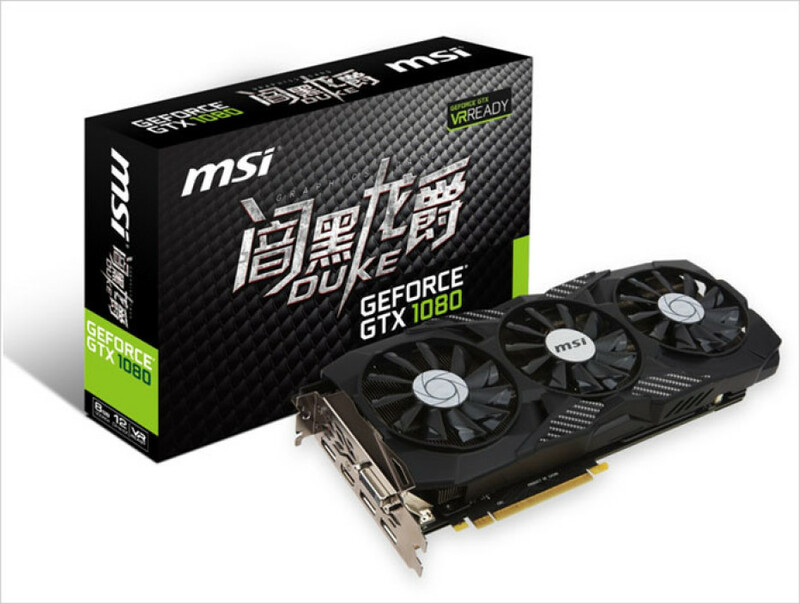 MSI has continued its NVIDIA video card expansion with the announcement of two new DUKE Edition graphics cards that target the Asian market. The cards are called GeForce GTX 1070 DUKE Edition and GeForce GTX 1080 DUKE Edition. The two new MSI cards are based on the company’s Gaming X series and feature a PCB that is shorter than the cooling solution, which is something unusual. They are also equipped with a triple-fan cooling solution that must deal with the hot climates in Asia. The GTX 1080 DUKE Edition is factory-overclocked – the card runs its GPU at 1708 MHz and in OC Mode the GPU reaches 1847 MHz. The card comes with 8 GB of GDDR5X memory that runs at 10108 MHz. The GTX 1070 DUKE Edition comes with a GPU at 1607 MHz (1797 MHz Turbo) and 8 GB of GDDR5 memory at 8108 MHz.